It is almost Bbq season! After a long winter we’re all excited to get outside. This year I’ve been getting more requests for outdoor kitchen designs, from simple built in grills to more expansive designs with pizza ovens, bar seating, refrigerators and lighting. I went on a bit of a field trip last week to Yankee Fireplace and Patio in Middleton to take a look at their outdoor grills and accessories. They carry a number of lines that drop in to fully custom or modular kitchens. Here are a few companies I checked out. 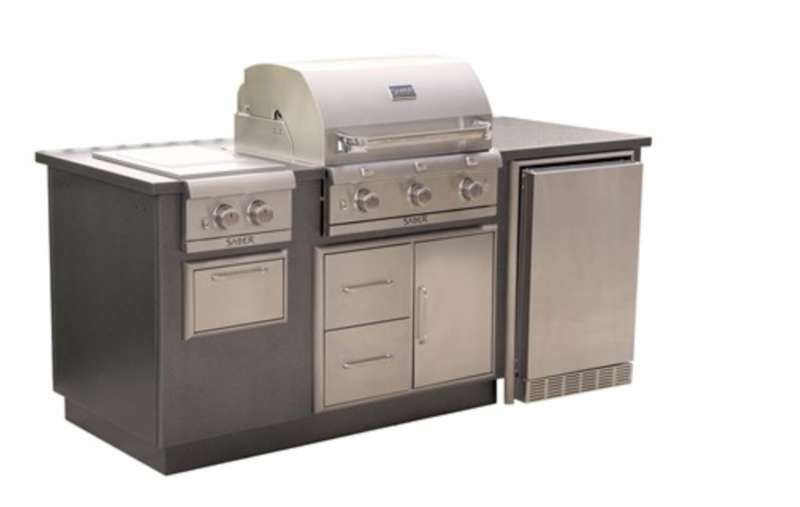 Lynx offers both their Professional series and Sedona series ( a more affordable line) of grills and accessories. The professional series includes everything you could want in an outdoor kitchen; from grill tops to warming drawers, pizza ovens, smokers, vent hoods, bar feature and draft taps. 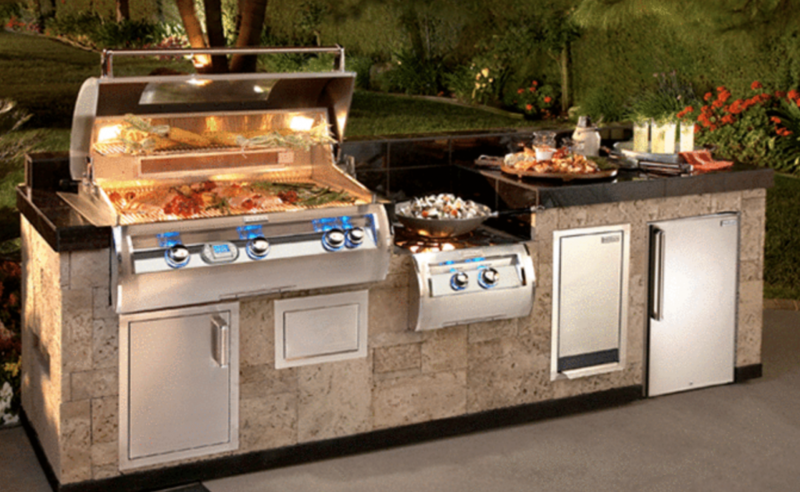 Firemagic offers built in gas and charcoal grills as well as counter top and stand alone electric grills. With a number of prefabricated island systems (where components drop in), outdoor kitchen construction can be streamlined and cost effective. Sabre offers two island options where you can customize features to include a grill, side burner and refrigerator. A more complete line of accessories allows for fully customized outdoor kitchens. 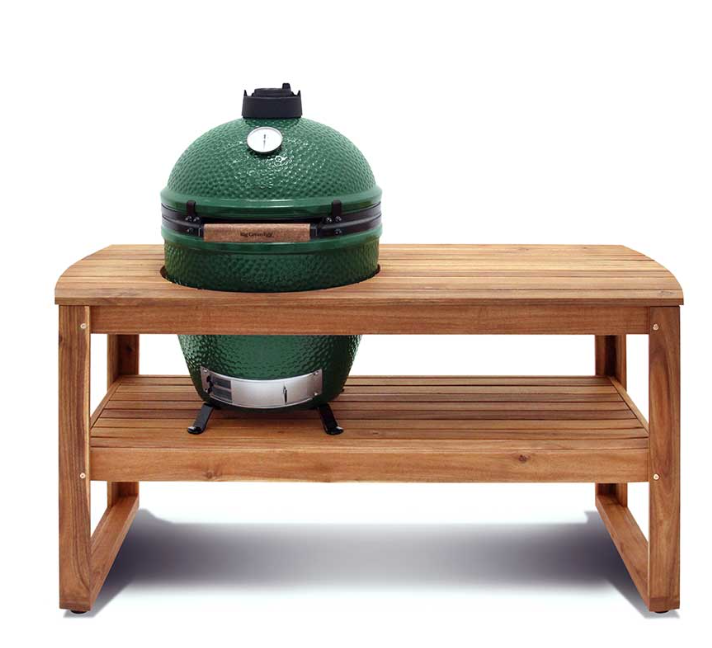 The Big Green Egg, while a stand alone ceramic grill/smoker, can also be integrated into tables or modular islands. This year the company is offering modular nests and side tables with wood or steel tops to customize a kitchen area. Outdoor kitchens can be simple, or have as many features as your indoor kitchen. If you’re considering adding these features to your landscape let us know, we’d be happy to help you think through all of the possibilities!